2017 brought the birth of this blog (and Instagram) which helped launch me more fully into my passion for sewing and repurposing fabric. I have a lot to be proud of in 2017 but there is one thing I'm seeking to be better at...balance. The last few months of 2017 I pushed myself to sew almost every day and keep up with the 'output'. This left me feeling burnt out pretty quickly and longing for a way to pursue other creative passions as well as my biggest love, sewing. I shared on my Instagram my #2018makenine which has been really helpful in anchoring down my makes to spread throughout the year. Scattered in-between these 9 items I plan to do other projects and garments, but I know I will be really proud if I can take my time to create 9 solid, well-made items this year. I selected patterns for garments that would fill holes in my closet and challenge me personally. I plan to make muslins of most of the items to give attention to fit and fabric choice. In all of this I hope to slow down a bit in order to give my best intention and effort into each area of my life, family, and home. Sewing is such a high for me I can easily neglect other important things and I don't want to do this. By creating this system, I pray I can enjoy my craft, learn new things, be present with my family, and keep a happy orderly home. Praying you have a wonderful 2018 and meet the end of this year with a sense of accomplishment and growth! For my very first post, I thought I'd introduce this space by answering a few questions to familiarize any new visitor. 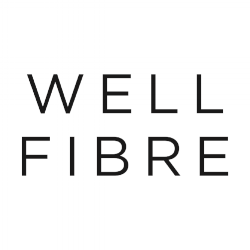 Who is behind Well Fibre? My name is Star White. I'm a Kansan living in Wichita with my husband, 2 babies, and dog. I have blogged in many places over the years (I like to call myself a 'recovering fashion blogger'), but one thing has remained true...my love for textiles. I took my first sewing class in 6th grade where I discovered a natural talent and love for sewing. Since that time my love for fiber and sewing have only increased. I feel this space is a culmination of my journey with textiles throughout the years. In 2016 I did my first capsule wardrobe and also watched the incredibly impactful documentary 'The True Cost'. My eyes have been opened and my heart stirred that the way we think about textiles must change. My personal habits have completely transformed and I'd like to share some of that transformation here with you on Well Fibre. Well Fibre is a blog space to share my journey toward a sustainable and hand made wardrobe. I also want to share small steps I'm taking toward a more zero-waste textile lifestyle and other well-fibre practices. At some point I hope to sell some of my textile creations so that may appear on this space at some time in the future. What is a well-fiber practice? Any practice related to textiles that reduces, reuses, or recycles a fiber. I will be using the term 'well-fiber practice' throughout this space. Where did the name Well Fibre come from? The name 'Well Fibre' has a lot of meaning for me. This last year I struggled deeply with post partum depression and I can truly say that I was in a place of not being 'well'. Down to the fiber of my being I felt hopeless. The journey of coming out of that place has been long and slow, but I feel I'm in a place now where I can see that no matter what my circumstances, I am always well at my deepest fibers. My 'wellness' is found in an eternal hope, not in my own strength or resolve. Additionally, my main fabric of choice is almost always linen. Linen and I have a love affair that is undeniable. It is a fiber that has been believed to help heal the body and make the wearer feel well. Linen has been used since ancient times and is one of the most sustainable textiles. It is what I would consider a 'well fibre'. I chose to spell fiber with the traditional English and Canadian 'RE'. I find the spelling eye catching and a nod to my travels to England. What can I expect to see on Well Fibre?